Be an eco-tourist on our snorkel safari program! Home/News/Be an eco-tourist on our snorkel safari program! It’s all going to plan and it’s been a great start with our international clients enjoying our newly transformed 1-Day snorkel safari program at our premier PADI 5 Star IDC Dive Centre on Gaya Island! We fulfill responsible tourism into each of our holiday packages when you experience beautiful Sabah. Our approach to conservation has become a daily effort during our snorkel safari program, in which our PADI professional guides conducting it will bring with them mesh bags provided by Project AWARE. The intent is to include our snorkeling clients to participate in the activity of goodwill to collect any marine debris found. 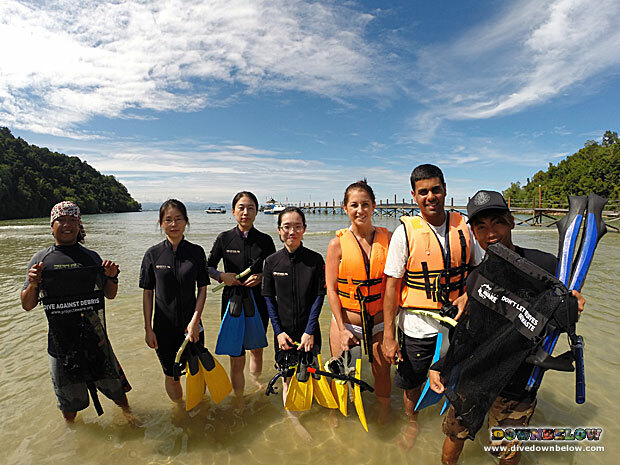 Each of the three sessions of the program will be provided a briefing about where in the Tunku Abdul Rahman Park the session will be conducted and what coral and fish species are atypical for the snorkelers’ education of our local area. The most negative culprit effecting our local environment is the scourge of the ‘silent killer’ – marine debris! Over time, integrating the conservation activity to collect marine debris during our very popular snorkel safari program will make a noticeable difference to the health of our marine environment! Contact our Head Office for further details on how we can create a Borneo holiday to make a difference! By Joanne Swann|2014-09-18T12:02:10+08:00September 9th, 2014|News|Comments Off on Be an eco-tourist on our snorkel safari program!